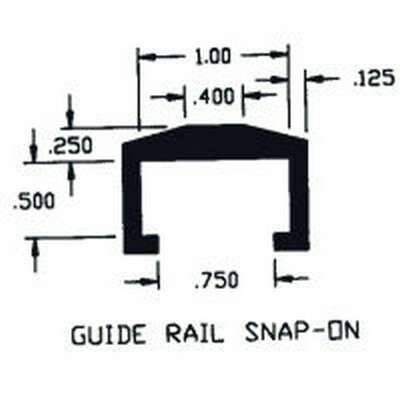 1.00" x .500" ID Guide Rail Snap-On Extruded Profile | U.S. Plastic Corp.
Duravar is used for wearing shapes because of its superior performance. UHMW has good wear resistance and low friction properties in both wet and dry environments. Resistant to abrasion and noise absorption. Available in white only. High abrasion resistance. High impact resistance. Chemically inert. Zero coefficient of friction. Non-caking and sticking. Meets FDA/USDA requirements. Good electrical properties. Easily machined. Sold in 10' sections only.